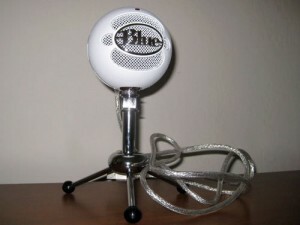 For such a small, inexpensive USB mic Blue makes lofty claims about the Tiki. In Intelligent Speech Mode it minimizes background noise. 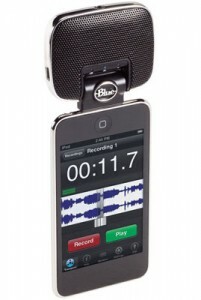 In Natural Recording Mode it balances levels from various sources such as vocals and acoustic guitar. While this seems like godsend on paper, anyone who‘s applied noise gates and various filters to accentuate sounds is better tuned to the reality. When you gain one advantage via heavy tinkering you usually do it at the cost of another. I found the audio quality in Intelligent Speech Mode to be below average due to internal DSP processing which rendered it dull and muffled. While this mode is designed for use with Dragon NaturallySpeaking or Skype, it ironically crippled speech recognition capabilities. Natural Recording Mode faired better however the processing to make various instruments equal in volume wasn’t pronounced enough to place this above solutions such as Samson’s excellent Go Mic, which I reviewed here. Besides, most people are picking this up for its Intelligent Speech Mode. 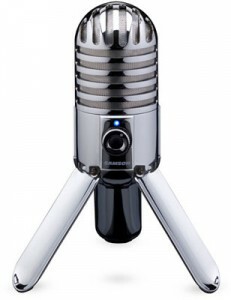 One reason it can’t see serious podcasters or musicians using this is due to the awkward mic placement. Granted condenser microphones are adept at picking up distant noises but it’s awfully low to be speaking or singing into. This lowers proximity effect so the deeper frequencies in the voice won’t be as pronounced. Another fatal flaw is the way the Tiki plugs into the USB input. The USB connection is oversized, putting unnecessary stress on the input of Apple laptops particularly. The convenience of doing away with cables that run to the device is clever on paper but again real-world application isn’t so hot. If you value your hardware you’ll be using a USB extension cable and that defeats the purpose of the design. Despite the gripes if you want to record rough music AND use Skype and don’t have much money to spend the Tiki is a decent solution as it’s a jack-of-all-trades. 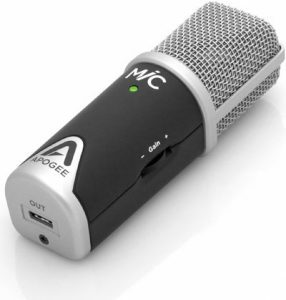 Still, the gimmick-free Go Mic is a better bet. 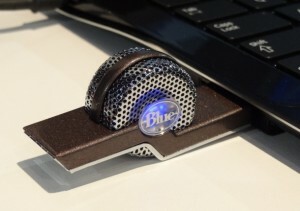 Shure has taken a much different approach to XLR to USB conversion than its nearest competitor, the Blue Icicle. While the Icicle relies solely on software for adjustments, the S2U is surprisingly feature-rich for such a compact device with thumb dial controls for gain, volume and monitor level. Arguably, even handier is the 1/8” headphone output at the side of its cylindrical housing. This allows you to monitor recordings in real-time and bypasses your computer soundcard. In practice this is helpful because you don’t feel chained to your computer while wearing headphones as you can place the X2U anywhere a XLR cable allows. As one would expect it provides +48V Phantom power for use with condenser microphones. The Phantom power button with corresponding blue indicator light is a nice touch as is the green light to show you the USB connection is functional. Build quality is excellent despite the somewhat unassuming appearance in photos. It’s of a formidable weight for such a small device. While this makes it roadworthy, you need to conscious of this factor when hooking it up. Although you can plug the X2U directly into a XLR mic sans the XLR cable, I wouldn’t recommend it as this creates unnecessary strain on the connectors. The sample rate is 16-bit, up to a 48 KHz. Overall sound quality is transparent and clean, as you’d expect from Shure. One weakness is you’ll need to tweak hardware gain and volume levels along with software volume to get the lowest noise floor possible. If you don’t like adjusting dials and don’t require this level of control, the Icicle may be a better option. The box includes a padded pouch and USB cable so if you don’t have any XLR cables kicking around, I recommend that you pick one up. 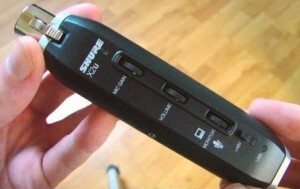 Overall the Shure X2U is a good device to have in one’s audio toolkit. Those who don’t have a pro audio interface will appreciate the comprehensive controls. For the audio buff that has everything, it may defeat the purpose, as the extra control will be more of a distraction than a big help with a multi-microphone setup. 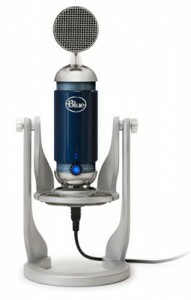 I’ve often recommended the ATR2020-USB as an alternative to the highly regarded Blue Yeti. As basic as it is in terms of functionality (just one polar pattern) and hardware controls (there are none), for some users and circumstances a simple solution with rock-solid build quality trumps all. More recently Audio-Technica has released the ATR2500-USB. It still has the quality feel and great sound of the 2020, however Audio-Technica has added features so it better competes with top offerings from Blue and Samson. The finish, though sporting a luscious silver sheen in promo shots is actually matte (see comparisons HERE). 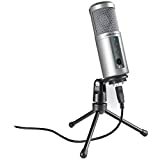 Adding to the unassuming appearance, the cylindrical exterior is the similar to a slew of other Audio-Technica mics, both XLR and USB. Audio-Technica knows what works and sticks to what does rather than attempting to wow you like Blue. Most notably there is now a headphone jack at the front so now you can do real-time monitoring rather than relying on your native soundcard output with less than ideal latency. The buttons with arrows pointing up and down respectively control the volume of the headphones. These additions are the biggest selling point of the 2500 over the 2020. Arguably Audio-Technica has only gone halfway with the hands-on controls (compared to the Yeti benchmark). While it’s handy to have headphone level buttons at your fingertips you’ll still need to adjust the mic gain level via software. From a design philosophy perspective this awkwardly sits at the middle ground; although the headphone functionally is welcome it would be more intuitive to either focus on real knobs and buttons or leave it all up to well-presented software. 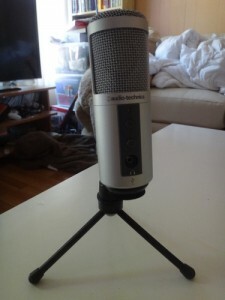 Like it’s older brother the 2020, the ATR2500-USB features just the meat and potatoes cardioid polar pattern, making it ideal for podcasting, voiceovers, and home studio work. While it’s nice to have the option to do omnidirectional recordings for room ambiance or to capture the several people on-the-fly, Audio-Technica knows most people won’t need it at all, and others rarely. Included in the box is a USB cable, manual, and mounting hardware so you can have it freestanding on your desk. The stand you get is a cheap plastic affair, which is to be expected in this price bracket. Likely you’ll want to upgrade to a solid desk stand right out of the gate since they can be picked up for less than $15. Sound quality is crisp, and well defined for the price as we’ve come to expect from Audio-Technica’s offerings. Zero-latency monitoring gives musicians in particular a huge advantage; singing or playing detailed parts is obviously much easier when delay, no matter how subtle, is eliminated. 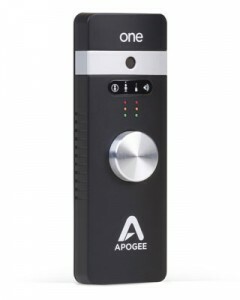 Overall the ATR2500-USB is one of the best USB mics currently available, knocking its predecessor the 2020 out of the running. The lack of a gain control and non-switchable polar patterns keeps it from topping the Yeti.